This past week has been hectic. I’ve got a couple of things going on at the moment that are rather exciting, but I can’t say much more, now, because I don’t want to jinx it 😉 Will tell you soon though, I promise! 1. Submit 1st assignment to Writers Bureau & start 2nd. Nope *deep sigh* but I did work on it. 2. Continue to work on Faber 25 word pitch & reading. Yep, but it’s still not finished. 3. Edit at least 1 chapter of Tangled. Nope, but I’ve decided to send it off to the RNA in first draft form. 5. Sort out outfit for Faber event. I have decided what I’m going to wear. I don’t want to look too posh lol….so I’m just going to go as me! I will need a new pair of shoes though. This entry was tagged Faber, Goals, Note Book, RNA, To Do List, Writer, Writer Resources, Writers Bureau, Writers Notebook, Writers Resources, Writing, Writing Goals. Bookmark the permalink. Oh my God Vikki, anything I have planned pales into insignificance compared to your Faber pitch, not to mention those other mysterious ventures!!! I feel nervous for you, but I’m sure you will carry everything off with great aplomb. I’m gearing up for the Aussie launch of the Water Doctor’s Daughters and preparing for the release of the Thames book…beside trying to tame my now jungle like garden. Warmest wishes and GOOD LUCK! Any week that includes the purchase of new shoes can’t be all bad! Seriously, you are so brave to do that Faber pitch. I’m quite impressed. 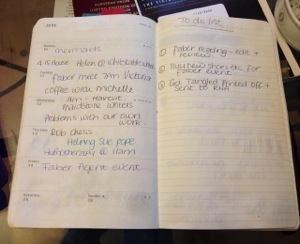 I really need to look into getting more organized with my to-do lists! This week, I plan to post another chapter for critique, but other than that, nothing more than a hope that will I write more words on the WIP. See what I mean? What a week! Good luck with your Faber pitch. Good luck on your pitch! Can’t wait to hear what it is you are cooking up. Good luck with the Faber pitch. That definitely deserves new shoes. Gosh, can see why you’re having trouble focussing! Hope it goes really well.